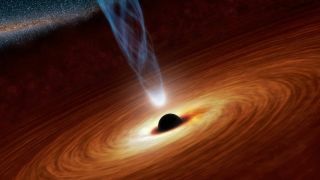 Artist's illustration of a supermassive black hole emitting a jet of energetic particles. Well, general relativity is a super-complicated mathematical theory. Quantum mechanics is just as complicated. It’s a little unsatisfying to respond to "How?" with "A bunch of math," so here’s the standard explanation: the vacuum of space is filled with virtual particles, little effervescent pairs of particles that pop into and out of existence, stealing some energy from the vacuum to exist for the briefest of moments, only to collide with each other and return to nothingness. Voila: The black hole appears to glow, and in doing so — in doing the work to separate a virtual particle pair and promote one of them into normal status — the black hole gives up some of its own mass. Subtly, slowly, over the eons, black holes dissolve. Not so black anymore, huh? Here's the thing: I don't find that answer especially satisfying, either. For one, it has absolutely nothing to do with Hawking's original 1974 paper, and for another, it's just a bunch of jargon words that fill up a couple of paragraphs but don't really go a long way to explaining this behavior. It's not necessarily wrong, just…incomplete. First things first: "Virtual particles" are neither virtual nor particles. In quantum field theory — our modern conception of the way particles and forces work — every kind of particle is associated with a field that permeates all of space-time. These fields aren't just simple bookkeeping devices. They are active and alive. In fact, they're more important than particles themselves. You can think of particles as simply excitations — or "vibrations" or "pinched-off bits," depending on your mood — of the underlying field. What does this have to do with black holes? Well, when one forms, some of the fizzling quantum fields can get trapped — some permanently, appearing unfortunately within the newfound event horizon. Fields that fizzled near the event horizon end up surviving and escaping. But due to the intense gravitational time dilation near the black hole, thy appear to come out much, much later in the future. In their complex interaction and partial entrapment with the newly forming black hole, the temporary fizzling fields get "promoted" to become normal everyday ripples — in other words, particles. Learn more by listening to the episode "Do black holes die?" on the Ask A Spaceman podcast, available on iTunes and on the Web at http://www.askaspaceman.com. Thanks to Andy, Rowan H., @MarkRiepe, @ChattaboxReilly, and @Just_Rachel for the questions that led to this piece! Ask your own question on Twitter using #AskASpaceman or by following Paul @PaulMattSutter and facebook.com/PaulMattSutter. Follow us @Spacedotcom, Facebook or Google+. Originally published on Space.com.